Keep Your Baby Safe With the Evenflo ExerSaucer! Where do you like to put your baby when you need both hands?? I really hope it is a safe place. Sometimes, (especially with "mommy" brain) parents may accidentally set a baby on a couch, bed, or chair not thinking about how a baby can fall, climb or roll off of these areas and get hurt! I'll be the first one to admit, I have failed in this area (SEVERAL times!) with my first child, my son! He was SO ACTIVE (and still is!) that he was rolling off things before I even knew he could roll (6 weeks!!). I couldn't take my eyes off of him for more than 1 sec. it seems! I immediately fell in love with baby items like ExerSaucers, Swings, and Jumpers that I could put him in to be safe but still play! This September is Baby Safety Month and Wayfair has a great selection of so many items to keep your baby safe this month! Wayfair is in the business of giving their customers easy online access to the world’s home stuff in one place. Wayfair believes that options for your home can come from just about anywhere, so they carry over 5,000 brands of products like furniture, lighting, cookware, and everything in between. They also know that home furnishings often don’t fit in your car, so they offer free shipping on most big stuff and most other stuff, too. I love their awesome selection of baby items and I immediately fell in love with the super cute Evenflo ExerSaucer Bounce and Learn Active Learning Center in Bee for my daughter. It is a really great place to put my daughter when I need both hands and she not only will be safe and eliminates the risk of her falling and getting hurt, but she can have fun, learn, and entertain herself! 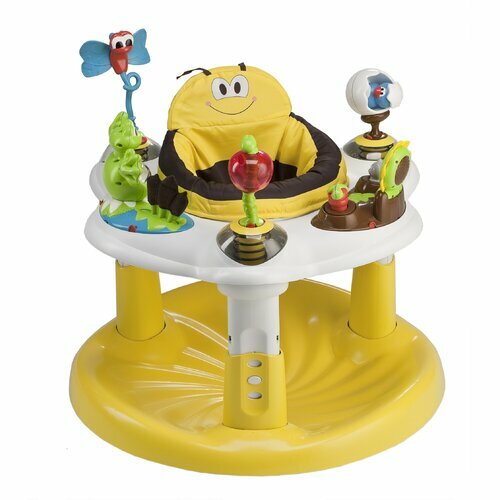 I have never seen such a cute ExerSaucer and I love the "Bee" theme - it is gender neutral and so adorable! I also love how many learning activities it has - way more than I have ever seen on another ExerSaucer. It has 55 Fun learning activities that help babies achieve important developmental milestones!! Plus, it is unique because it is also a Bouncer! It offers twice the bounce as previous models and a 3-Position height adjustment for the perfect fit! I also really love that it has take with me toys that provide for customizable learn and play experience. It is suitable for 4 months to walking age and keep in mind that assembly is required. So as you celebrate Baby Safety Month and focus on baby proofing your house, take a selection of all of Wayfair's household and baby products all in one place!! Buy It: You can purchase the Evenflo ExerSaucer Bounce and Learn Active Learning Center in Bee for $68.99 on the Wayfair website.